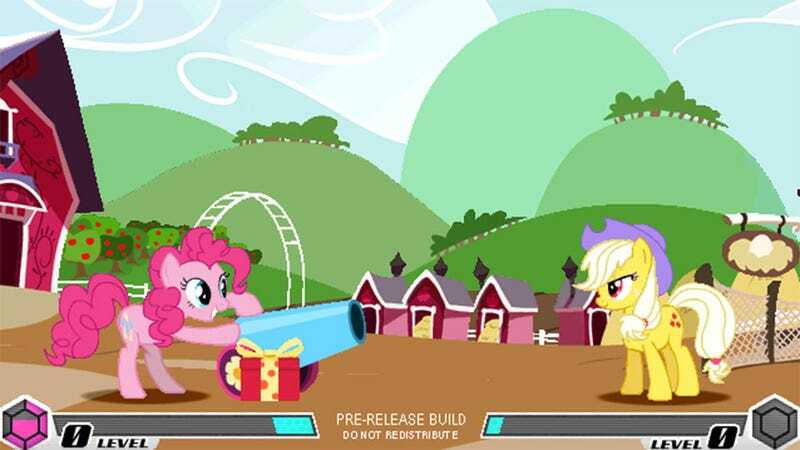 Since the summer of 2011 a small group of fans calling themselves Mane6 have been toiling away at a fighting game based on the cartoon My Little Pony: Friendship is Magic. Working from a rudimentary knowledge of 2D Fighter Maker 2002, they built the fan project into a phenomenon unto itself. They scouted sound-alike voice actresses, had composers create original music, and painstakingly balanced and polished the fighting engine to a professional shine. Last month My Little Pony: Fighting is Magic was in the running to be featured at the 2013 Evo fighting game tournament. Today Mane6 announced that they had received a cease and desist letter from Hasbro. They’ve pulled all content from their website, stripped their YouTube and Twitch.Tv accounts, and closed up shop. We have attempted negotiating with Hasbro for the continued use of the property in our non-profit, voluntary project, but so far we haven’t received an answer. As such, we’re complying with the contents of the C&D letter until we receive answer from their PR and/or Legal departments. I’ve been following the game’s development for the past year and a half, and I figured this would happen sooner or later. The game did use the likenesses and names of Hasbro trademarks, and despite there being no graphic violence in the game, showing popular cartoon characters battling each other isn’t in keeping with the tone of the show. The only real question here is why now? Perhaps the Evo tournament nod was a step too far for Hasbro. The company has been incredibly tolerant and even supportive of the show’s mature fan base thus far, going as far as letting full episodes of the cartoon exist on YouTube without attempting to have them taken down. With two members resigning over the past few weeks, even if by some miracle Mane6 and Hasbro came to some sort of compromise, it’s likely the door has already closed on the two-year labor of love. I had a chance to play Fighting is Magic briefly last year, and I have to say it was a damn good fighting game - probably too good to live.